Bright Morning Teacups, available now at Anthropologie. At $128 for a set of four, I don't think they'll be finding their way into my cupboard anytime soon, but a girl can dream. Have I mentioned I have a pretty intense mug collection? 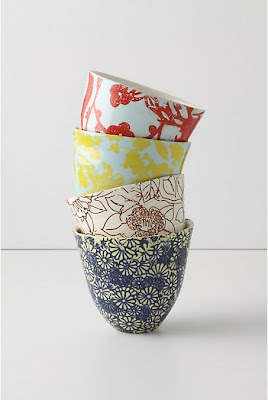 But teacups, well, I can always use more teacups. Tea tastes better when consumed from the proper serve ware. It's true.